copy and paste in the key and enter the same email used to request the key. This function will display one of the following statuses. 2- software is still in trial mode. 3- a Pamco-Imaging turntable is connected, which unlocks the software. A list of supported cameras with the version of software that is installed. Contact mark@pamco-imaging.com if you have any camera compatibility questions. This opens a note form with data showing the use of the software since it was last opened. (sometimes referred to as the "error log" or "bug log". Email this to mark@pamco-imaging.com if you have an issue with the software. Automatic upload of the error log file if computer is connected to the internet. Best to email mark@pamco-imaging.com to advise you have sent an error log. 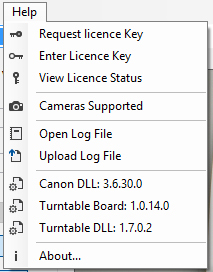 Canon DLL : version of the camera driver package. Turntable Board : Pamco-Imaging reference number for turntables. Turntable DLL : version of the driver package for the turntable.